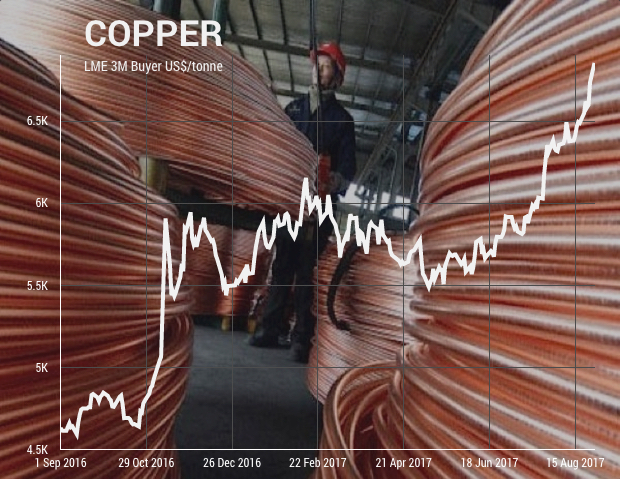 December copper futures trading on the Comex market in New York powered ahead on Monday after hedge funds pushed bullish bets on the metal to fresh record highs. Copper touched a high of $3.1095 a pound ($6,855 per tonne) up more than 1% from Friday's closing price and the highest since October 2014. Copper is now up 23.4% in 2017. 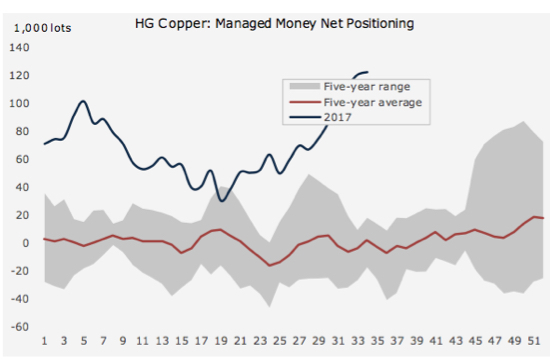 Hedge funds built long positions– bets on higher prices in future – in copper futures and options to a new record high last week according to the CFTC's weekly Commitment of Traders data. So-called managed money investors' net longs now total over 122,000 lots, the equivalent of over 3 billion pounds or nearly 1.4m tonnes worth $9.5 billion at today's prices. With speculative interest in unchartered territory (see graph below) some analysts are expressing doubts about the sustainability of the rally given the fundamentals of the industry – less than stellar demand growth flattered by higher than usual supply disruptions – haven't changed much. "We think that this is a market that is overreacting to short-term conditions and ignoring several warning signs." "Yet something seems off about this recent rally, and we still remain skeptical of its strength and duration," wrote Barclays' Dane Davis. "We think that this is a market that is overreacting to short-term conditions and ignoring several warning signs."